Louis Spencer’s new work The Big City has come full circle. Bringing together clowning, cabaret, comedy and puppetry in what he describes as “a Pixar-esque bundle”, The Big City began its life as a ten-minute piece, as part the Blue Room Theatre’s 2017 “600 Seconds” program at Fringe World. Ahead of the premiere of the full-length version of the show, Seesaw caught up with Spencer to find out more about his path to clowning. Seesaw: When did you first know that you wanted to be an artist? Louis Spencer: Probably when I was in my early 20’s and trying to figure out if I should do something that I love or just get a job. At the time though the word “artist” wasn’t something that crossed my mind, rather I just knew that I wanted to be involved in theatre and the performing arts. I always wanted to be a performer when I was a child but I kind of went back and forth on if it was something that should actually go for. It wasn’t until I had been in university for a year or two that being an “artist” was something I considered. 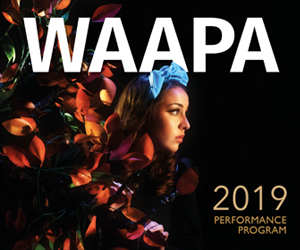 LS: I studied at WAAPA in the Bachelor of Performing Arts – Performance Making course; it’s still fairly new but its reputation is growing very quickly. I was very fortunate to be in a class with some people who have gone on to do some great work in Perth and become amazing artists. Seeing people that you love and respect do so well is inspiring. What I liked about the course itself was that it allowed you to find your path and discover your practice if you were willing to put the work in. LS: My focus, right now, is primarily on making work in the genre of clowning, mime and physical comedy – theatre that young people can enjoy but can also be appreciated by a mature audience. S: Career highlight so far? LS: I wouldn’t like to say I have one yet. I like to enjoy my success but also don’t like to rest on my laurels. I want to keep learning and getting better in my practice. LS: Also don’t like to think about that. I think to do so can be crippling. Anything that can be considered a lowlight should be looked at as a learning experience and something to look forward from. S: What do you love most about what you do? LS: Performing. It is such a rare opportunity to do it. We spend so much time making and working on a show yet we may only get to spend a couple of hours on stage actually performing. It should be cherished, no matter how the performance ends up. S: This isn’t your first time performing at Fringe World. What drew you back? LS: The piece that I’ll be presenting this year was developed from work I presented two years ago as a part of The Blue Room Theatre’s “600 Seconds” program. I decided the genre of clowning and physical comedy was something I wanted to develop into a full length stage show. And here we are! LS: The Big City follows Joe the Clown as he ventures into an unknown urban terrain in search of theatrical stardom. At the same time he hopes to reconnect with a long lost friend who did what he is attempting a few years earlier. As with my previous clowning work, I have taken inspiration from the stars of the silent film era, such as Buster Keaton and Charlie Chaplin. I was also inspired by a little-known Martin Scorsese film called After Hours, in which the protagonist faces innumerable obstacles in his journey just to make it home from work. S: Aside from your show, what are you looking forward to seeing/doing at Fringe? LS: Feminah – Anything by Charlotte Otton is worth checking out. Front – Featuring an exceptionally talented cast. F**K Decaf – Looks really interesting and is performed on the beautiful Alex Hotel rooftop. Poorly Drawn Shark – Will be wild. Dad – a touching, funny show by recent WAAPA Performance Making grads. S: What’s your favourite part of the playground? LS: One of those really high, curly slides that felt like they went forever when you were a kid. The Big City plays The Blue Room Theatre Summer Nights, 18-20 January.